Contributing to the procrastination of film lovers everywhere. You know I'm not one of those blogs that simply posts links to other sites, so I got away with it this time by creating some original content. "Original Content" means "5 minutes with Photoshop 5.0.2" (©1998! ), but whatever, you're lucky you got this much. I'm supposed to be asleep right now. Check out FilmWise Invisibles, a weekly quiz run by FilmWise. 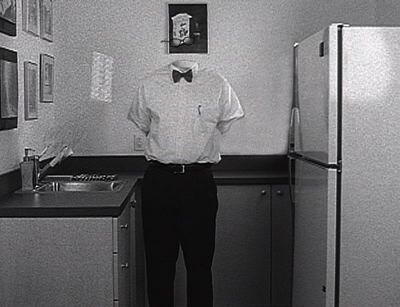 Thanks to The Invisible Man ([not] pictured below) for sending me the link.